Since Vatican II, the Conciliar Church has promoted a “stay-as-you-are” mentality: that is, let each one remain in the sect of his choice - or none at all if that's what he wants. Today’s picture could not be more symbolic of this wrong idea. 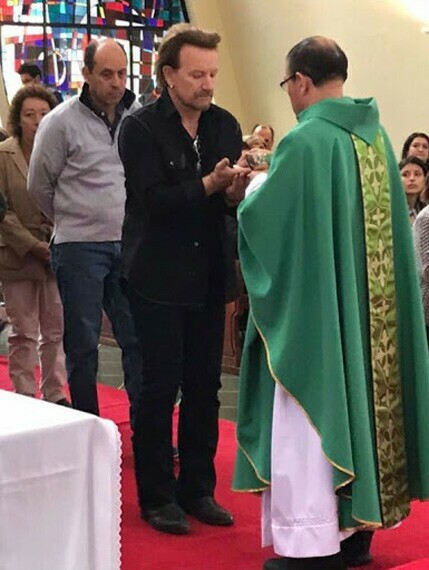 Pictured above is U2’s lead singer, Paul David Hewson (aka “Bono”), receiving Communion in Bogotá, Colombia on Sunday, October 8, 2017. The rock group was on their South American tour last weekend when, despite not being a Catholic, Hewson decided to take a break from his “busy schedule” to stop by a chapel for Sunday Mass and openly profane the Eucharist. Progressivist news outlets, however, are praising this gesture, saying that it was admirable to see the rocker praying in silence. First, U2’s rock “music” promotes degeneration and revolt in youth as we have seen here. Their most recent music video, “You’re the Best Thing About Me” is evidence of this, as it features body-mutilation, “free-love,” immodesty, androgyny, religious relativism and the youth clubbing culture (here). This recent song is also being used to promote Georgian filmmaker Tatia Pilieva, whose claim to fame was her short film featuring 20 strangers kissing for the first time – including women with women and men with men. Second, U2 is a “politically and socially conscious” humanitarian group that promotes blatantly revolutionary ideas, including a Panreligion and One World Order, Masonic ideals that are radically opposed to a true Catholic society. Third and most important: Hewson subscribes to a so-called “non-denominational” strain of Protestantism and works actively with Evangelical Protestant “humanitarian” groups. Not surprisingly, he has voiced strong support for Francis, not as the Vicar of Christ, but merely as an agent fighting poverty and world hunger (here). Below first row, Bono mouth-kissing Adam Clayton; second row, tongue-kissing Liam Gallagher, third row, posing as a devil when performing as Mr. MacPhisto.